In news from the department of cartoons, both Strawberry Shortcake and Angelina Ballerina have gotten makeovers. I don't care if the powers that be want to reinvent cartoons to "modernize" them; I certainly don't have any strong attachments to these characters. 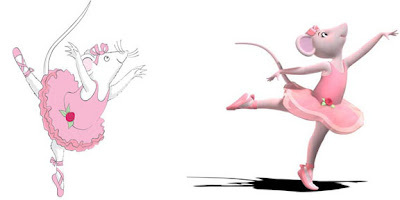 But in the case of Angelina Ballerina, I have a strong and visceral reaction to the fact that she's no longer a ballerina. On the left is the old version. She's on pointe, her back leg is in a lovely well-turned out arabesque, she's making a beautiful line. The updated version is on the right. Look at her! She's no longer on pointe, there's no arch to her standing foot, her working leg isn't turned out, and her head and neck are lumpen. In short, the original Angelina Ballerina was drawn by someone who understood ballet, who knew what a dancer should look like. The new one? That person has never seen a dancer. Period. I adore you for your standards. My mom, a dancer, would have loved to read this. There is definitely a lot lost in that new Angelina--I don't know enough about ballet to put the words to what you see, but there's clearly a life and elegance in the old Angelina that's terribly missing in the new one. Oh, I DEFINITELY like the old Angelina better. And you're right about the terrible stance of the new one - what is up with that? I agree; I like the old Angelina a lot better. The new one is not in true ballet form AND she's all pixels. Bleh. i wouldn't have known all the technical stuff, but you can see the change in the energy between the handdrawn angelina and the computerized one. There's movement and energy in the first, and stasis in the second. Why, she (the new one) looks a lot like the first years I watched today. This is timely for me because today was our ballet recital (I can say mine because I'm stage manager) and if our dance teacher (she's mine too) saw any kid looking that sloppy, she'd be yelling. This is typical computer generated slop. I don't care how good the technology has gotten, it loses its raw energy. I don't have a problem with no pointe, because girls Angelina's age aren't supposed to be on pointe anyway. Average age for that is about 12-14, because they have to build up to it. But that is no position for her foot to be in, doing an arabesque. Both my girls ended dances today in arabesque poses, BTW! Longtime reader/lurker her - love your posts! Perhaps the new Angelina is drawn by a frustrated beginning ballet student who hasn't made it past demi-pointe! I'm sad to see the delicate charm of the original isn't carried through. you know what else? The 'old' one is plumper and more like a little kid. The 'new' one is slim. Are they changing how she looks for the books as well? That's all we care about here. Ee gads. That's a terrible makeover. oh, my own naomi has had enough dance that i see what you mean! This is me catching up on weeks of reader neglect.